I will probably keep a container of ginger simple syrup in the refrigerator for the rest of my life because it's just that good and complements an enormous number of spirits. This simple syrup is also delicious in hot tea, over green tea ice cream, in a tall glass of lemonade ice tea, or over pancakes. Directions Peel a medium sized ginger root and slice into pieces. 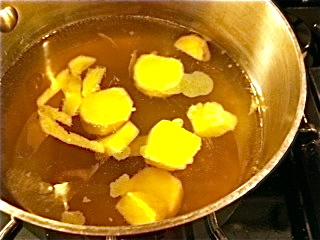 In a saucepan, combine the water, sugar, and ginger and bring to a boil. Reduce the heat and simmer until the sugar has dissolved, about 30 minutes. *Add more sugar if you desire a thicker consistency. Remove the saucepan from the heat and strain into a container. Cool, and refrigerate up to a week.